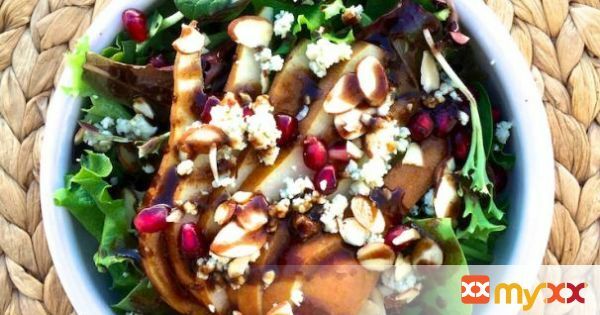 Bosc pear and blue cheese salad with a pomegranate balsamic dressing. A wide spectrum of flavors packed into one simple salad. 1. Add the pomegranate juice, balsamic, garlic, honey, and thyme into a small saucepan on high heat and bring to a boil. Simmer until the liquid has reduced by half; about 15 minutes. Strain into a bowl and set aside. 2. Combine 1 tablespoon of the reduction with the 1 tablespoon olive oil and 1 teaspoon dijon mustard in a small jar or tupperware container with a lid. Seal tightly and shake until all ingredients are combined. Add salt and pepper to taste. 3. Plate the greens, then top with the sliced pear, pomegranate arils, sliced almonds, and blue cheese crumbles. Drizzle the dressing over top with a spoon.